In this Lookbook, you will get a SNEAK PEEK at all the prizes that are being sponsored by all 108 blogs for this year’s Fashionista Event, hosted by Still Blonde after all these Years and Modly Chic. Event is co-hosted by K Squared Glamour. OH WOW! 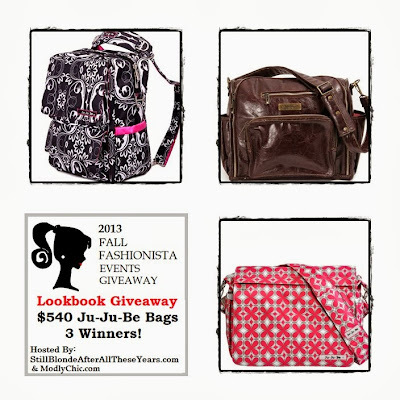 Ju-Ju-Be is our Lookbook sponsor for the Fall Fashionista Events Giveaway 2013! They have provided us with three of their darling bags. The winner of each bag will be able to choose their colors. Up for grabs is the PackABe , the BeFabulous in Earth Leather, and the BetterBe. Let’s take a look at these beautiful bags that can be used as everyday totes or high end diaper/parent bags. Watch this video as Susan, the owner of Ju-Ju-Be Bags describes these amazing bags with a presentation of the BetterBe. Disclaimer: Still Blonde after all these Years, Fashionista Giveaway Events, or the Fashionista Giveaway Event bloggers are not responsible/liable for any product defects or for sponsors that do not fulfill their prizes. I received no compensation for the above post. This giveaway is part of the 2013 Fall Fashionista Giveaway. Giveaway is open to US residents only, 18+ years or older and will run from September 24th, 2013 until October 9th, 2013. I love the behave bag!! It's so cute and comes in a reach chocolate brown with a teal lining....can you say trendy??? It matches my boots perfectly!